Trainer Charles Appleby will be represented by a pair of talented Godolphin runners on next weekend's lucrative Ricoh Woodbine Mile undercard. Hawkbill, a multiple Group 1 winner, will be taking his second attempt at the Grade 1 Northern Dancer Turf. Last year, the now-five-year-old son of Kitten's Joy finished second, by a head, in the $300,000 1 1/2-mile turf marathon to local hero, Johnny Bear. The talented chestnut returned to action in March in Dubai and posted consecutive wins in the Group 2 Dubai City of Gold and the Group 1 Dubai Sheema Classic. La Pelosa, a two-year-old daughter of Dandy Man, will take part in the Grade 1 Natalma Stakes, which is a 'Breeders' Cup Win and You're In' event contested at one mile over the world-famous E.P. Taylor Turf Course. The duo arrived just after the conclusion of Saturday's Woodbine card from England by way of Frankfurt, Germany. Hawkbill arrives in good order ahead of Saturday's turf test. “He's getting older, but he will try. He always puts his heart into it. Hopefully he can have a little revenge on last year when he got beat by next to nothing at the post,” said Chretien. La Pelosa boasts a record of 1-2-1 from five starts and will be stretching out to a mile for the first time in Sunday's Grade 1 challenge. “She's a nice scopey, big filly. She's strong and athletic,” said Chretien. 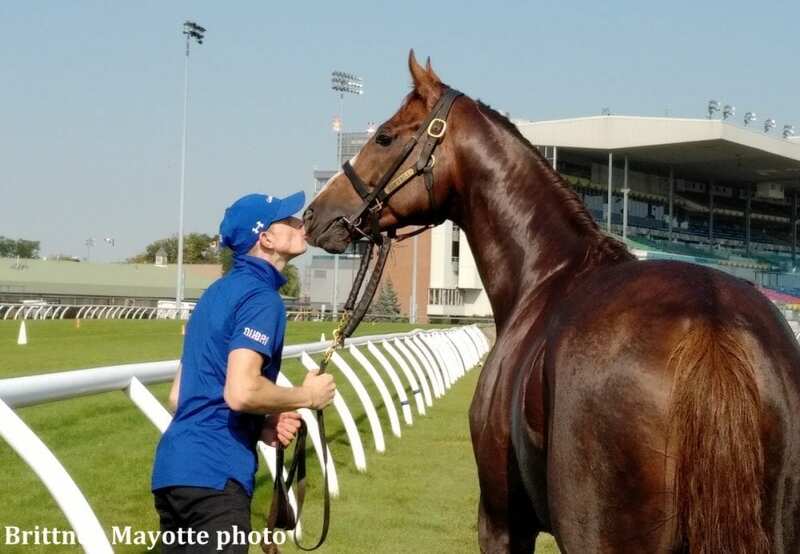 This entry was posted in Racing and tagged charlie appleby, Godolphin, hawkbill, northern dancer stakes, Sophie Chretien by Press Release. Bookmark the permalink.